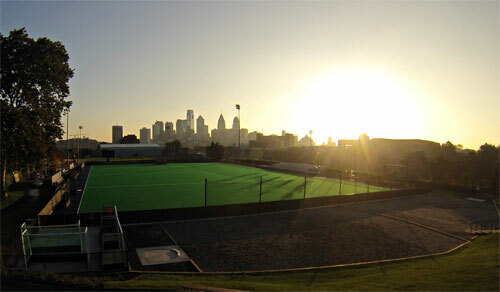 Ellen Vagelos C'90 Field was opened in September 2013 and is the home of the University of Pennsylvania field hockey team. 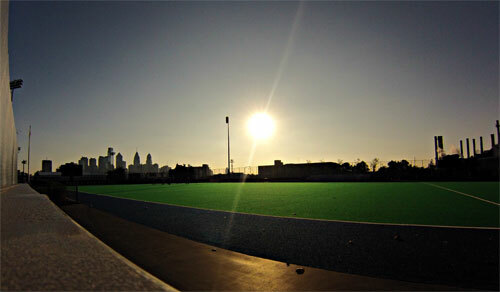 The Astroturf venue features seating for approximately 500 fans, a new video scoreboard, a watering system that makes the field ideal for field hockey, expanded dugout bench areas for the home and visiting squads, and a deck between the benches that allows for media and game operations. Take Exit 326 (Valley Forge) of the PA Turnpike. Follow I-76 East to University Avenue Exit (exit 346b). Bear right at the traffic light and make the first right into the parking lot (cooling plant will be on your right side) - RIVER FIELDS DRIVE. (The turn will occur just before you go under a railroad bridge.) Follow the road past Meiklejohn Stadium (baseball field), and turn left where the road bends. Ellen Vagelos Field (field hockey) and then Rhodes Field (soccer) will appear on your left as you continue down the road. Take exit 4 off the N.J. Turnpike. Take 73 North to I-295 South to the Walt Whitman Bridge. Take I-76 West to the University Ave. exit (exit 346b). Go through three traffic lights and make the next right into the parking lot (cooling plant will be on your right side) - RIVER FIELDS DRIVE. (The turn will occur just before you go under a railroad bridge.) Follow the road past Meiklejohn Stadium (baseball field), and turn left where the road bends. 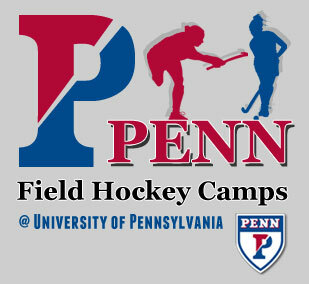 Ellen Vagelos Field (field hockey) and then Rhodes Field (soccer) will appear on your left as you continue down the road. Follow I-95 North to Pa. 291 East and follow signs to I-76 West. Follow I-76 West to the University Ave. exit (exit 346b). Go through three traffic lights and make the next right into the parking lot (cooling plant will be on your right side) - RIVER FIELDS DRIVE. (The turn will occur just before you go under a railroad bridge.) Follow the road past Meiklejohn Stadium (baseball field), and turn left where the road bends. Ellen Vagelos Field (field hockey) and then Rhodes Field (soccer) will appear on your left as you continue down the road. 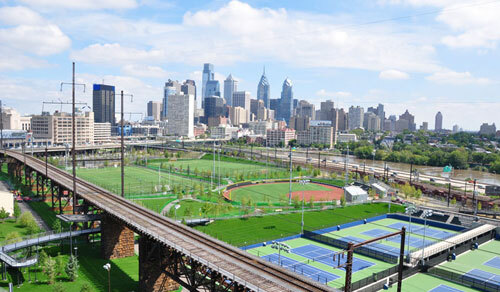 From the Quad, take Spruce Street/South Street past the Museum and the University City train station. On the right is the Hollenback building. Make a right and then make a quick left down the stairs. Follow the stairs down to the ground level and head towards the right around the building. Walk along the sidewalk; Ellen Vagelos Field (field hockey) and then Rhodes Field (soccer) will appear on your left as you continue down the road. From the Quad, take 38th Street toward University Ave. Follow the sidewalk past the hospital parking garages and under the train tracks. The entrance to Rhodes Field is on the left - RIVER FIELDS DRIVE. Walk past Meiklejohn Stadium (baseball), turn left where the road bends. Ellen Vagelos Field (field hockey) and then Rhodes Field (soccer) will gradually appear on your left as you continue down the road. Take Exit 326 (Valley Forge) of the Turnpike. Follow I-76 East to Exit 346A (South Street). (exit is on left side of the highway) Turn right onto South Street and go two traffic lights (passing Franklin Field on the right) to 33rd Street. Turn right on 33rd. Go to Chestnut Street (second light) and make a right. Go to 31st Street (second light, just after the elevated train tracks) and take a right. Parking for Penn Park will be at the end of the street, where 31st Street bends to the left. Take exit 4 off the Turnpike. Take I-295 to the Walt Whitman Bridge (a toll bridge). Take I-76 West to Exit 346A (South Street). Turn left onto South Street and go two traffic lights (passing Franklin Field on the right) to 33rd Street. Turn right on 33rd. Go to Chestnut Street (second light) and make a right. Go to 31st Street (second light, just after the elevated train tracks) and take a right. Parking for Penn Park will be at the end of the street, where 31st Street bends to the left. Follow I-95 North to Pa. 291 East and follow signs to I-76 West. Follow I-76 West to Exit 346A (South Street). Turn left onto South Street and go two traffic lights (passing Franklin Field on the right) to 33rd Street. Turn right on 33rd. Go to Chestnut Street (second light) and make a right. Go to 31st Street (second light, just after the elevated train tracks) and take a right. Parking for Penn Park will be at the end of the street, where 31st Street bends to the left.